If you are reading this, it is likely you are a Democrat chomping at the bit to cast off the ultra-conservative Congressman Doug LaMalfa from District 1 and replace him with an earnest and sincere political leader who will truly represent our interests. Enter Audrey Denney, both a farmer and an educator, as our candidate for the November election. She is not the first Democrat to run against LaMalfa, but our hopes are high that she will snag the seat. Our district stretches far and wide, all the way to the Oregon Border, and of the counties contained in that seat, many lean to the right. So we have our work cut out for us to win this campaign for Audrey: Register voters, encourage Democrats to vote in November, and get our candidate’s name out into the public repeatedly. The simplest and most effective way to start out is to drop by campaign headquarters located at 138 E. Main Street in Grass Valley. This is also the Nevada County Democrats headquarters, so you are in the right place. Introduce yourself to Riley Grim, Campaign Manager for Nevada County. She is looking for canvassers and phone bankers, and if that is up your alley, it’s a win-win. You can pick up a lawn sign to install and give Audrey tremendous local exposure. They are going up as we speak, so keep an eye out for them and add yours if possible. You can also get a button to sport around town. Remember to wear it if you head to any of the other counties of District 1. Voter turnout was not great in the last election, and we can turn that around! To become an informed campaigner, be sure to visit Audrey’s website at least once, and the more often the better: www.audreydenneyforcongress.com. Here you can read about her platform on the pressing issues of the day by clicking on the word ‘Priorities’ located in the upper portion of the screen. This includes education, healthcare, job creation, agriculture and other key areas that we can all agree need improvement in our district and across the country as well. Take the time to familiarize yourself with her platform so that you are ready to discuss and answer inquiries when you canvass door-to-door or do phone banking. I was approached by a store clerk at Briarpatch Coop who spotted my Audrey Denney button. Thankfully, I had just read up on her positions and plans for action and was able to relay them to him, winning Audrey a vote! This may well happen to you if you walk around town with her button on your lapel or pocket, so be prepared. The website also offers online voter registration front and center on the Home Page. You can fund the campaign via this website as well. Put a little financial support where your heart is. 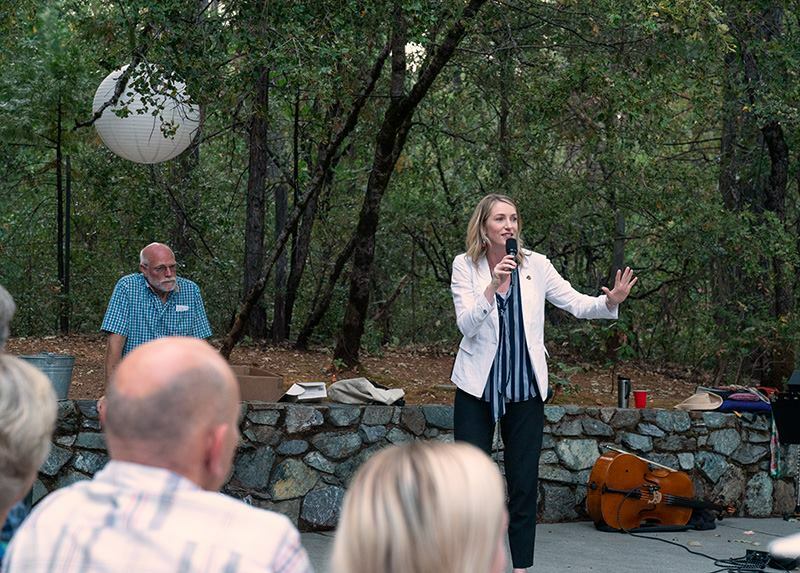 For the latest news updates, events, ongoing discussions, photos and videos related to the Denney Campaign, visit the Facebook page Nevada County Friends of Audrey Denney. For this you will need your own Facebook account. It is a closed group, meaning you must click “Join” and wait for acceptance. Once you have “Joined” status, you can post comments, photos, and videos on the site. Please keep them relevant to Audrey’s campaign. Click on “Events” located in the menu on the left side of the screen, and you will read about upcoming meetings and campaign activities. You can RSVP if you want to attend an event by clicking on “Going”, just below the event listing. Bottom line: Taking action for the Audrey Denney campaign is easier than ever with high-tech tools and the old-fashioned buttons and lawn signs as well. If you are determined (as I am) to turn District 1 blue and get Audrey elected, all your tools are at your fingertips and around the corner. See you there.